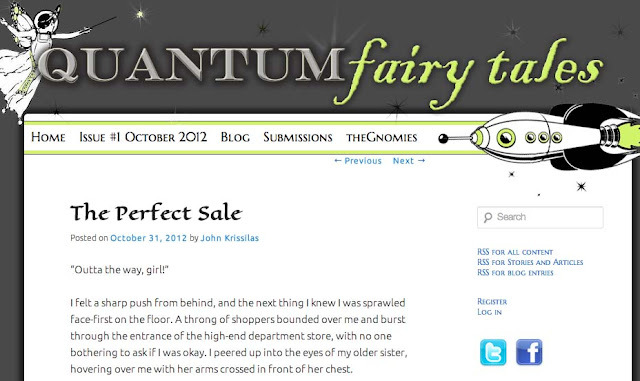 John Krissilas / Writer, Thinker, Storyteller: "The Perfect Sale" published in the debut issue of Quantum Fairy Tales! "The Perfect Sale" published in the debut issue of Quantum Fairy Tales! More exciting news! "The Perfect Sale", a satire of The Odyssey set in a dystopian department store and part of my IN-FUTURA short story collection, has been published in the debut Halloween issue of Quantum Fairy Tales. Check out the story here. "The Perfect Sale" is set in a zany yet not-so-far-fetched dystopian future in which jumpsuit-wearing shopping guilds dominate department stores and no one shops alone. It was inspired by the Groupon and flash sale shopping craze from a few years back, as well as our obsession with coupons and getting the best deal. In a thinly-veiled reference to The Odyssey, the story follows 14-year-old Odessa as she is initiated into her sisters' Guild, called The Lotus Eaters. As she dodges sketchy salesmen and a giant, visor-clad villain, she attempts to reunite with a product that has special meaning to her. I hope you enjoy this story! I'm also thrilled that "The Perfect Sale" has made its debut in the upstart e-zine of speculative fiction, Quantum Fairy Tales. Run by a Ninja Monkey, a Quantum Fairy, a Clockwork Gnome, and more, this brand spankin' new e-zine promises only the quirkiest stories, poems, and art. Make sure you check out the debut issue!